A State Department review board investigating the Sept. 11 attacks on American facilities in Benghazi found leadership and management failures in the department for not providing adequate security prior to the attack. "Systemic failures and leadership and management deficiencies at senior levels within two bureaus of the State Department … resulted in a Special Mission security posture that was inadequate for Benghazi and grossly inadequate to deal with the attack that took place," an unclassified version of the report made public Tuesday night stated. The report produced by a State Department Accountability Review Board also said, contrary to initial claims by President Barack Obama and his top advisers, that there was never a protest at the diplomatic compound where Amb. Chris Stevens and three other Americans were killed. The others were Sean Smith, Tyrone Woods, and Glen Doherty. Two other United States personnel were seriously wounded, the compound was destroyed, and it and a nearby CIA annex were abandoned. The board was headed by former State Department official Thomas Pickering and retired Adm. Mike Mullen, former chairman of the Joint Chiefs of Staff. The report also contradicted claims by Obama shortly before the attack that the al Qaeda terrorist group was declining and noted that the threat is growing. "The Benghazi attacks also took place in a context in which the global terrorism threat as most often represented by al Qaeda (AQ) is fragmenting and increasingly devolving to local affiliates and other actors who share many of AQ’s aims, including violent anti-Americanism, without necessarily being organized or operated under direct AQ command and control," the report said. "This growing, diffuse range of terrorist and hostile actors poses an additional challenge to American security officers, diplomats, development professionals and decision-makers seeking to mitigate risk and remain active in high threat environments without resorting to an unacceptable total fortress and stay-at-home approach to U.S. diplomacy." Secretary of State Hillary Clinton avoided testifying before Congress last month, claiming a trip to Australia precluded the appearance. She was supposed to testify this week but a State Department spokesman said she fell and suffered a minor concussion at her home, although she was not hospitalized. Senior State Department officials will testify in closed-door hearings set for Wednesday. U.S. officials have identified an al Qaeda-linked militia called Ansar al Sharia as the group behind the deadly attack that involved dozens of attackers who set fire to the compound. Less than two weeks before the attack, Obama said in his nomination acceptance speech at the Democratic National Convention that al Qaeda was on the "path to defeat." The report made no mention of the controversy over the administration’s misleading statements shortly after the attack when U.S. Ambassador to the United Nations Susan Rice appeared on five Sunday television news shows and asserted that the murders were the result of a "spontaneous demonstration" by Muslims protesting an online video. CIA-drafted talking points prepared for Rice were altered to remove references to al Qaeda and al Qaeda-linked terrorists in what critics say was a politicization of intelligence aimed at fitting the White House line prior to the Nov. 6 election that al Qaeda was nearly defeated as a terrorist group. "The Board concluded that there was no protest prior to the attacks, which were unanticipated in their scale and intensity," the report said. Also, the attacks were carried out with no intelligence warning. "The attacks were security related, involving arson, small arms and machine gun fire, and the use of [rocket-propelled grenades], grenades, and mortars against U.S. personnel at two separate facilities—the [Special Mission-Benghazi Compound] SMC and the Annex—and en route between them," the report said. "Responsibility for the tragic loss of life, injuries, and damage to U.S. facilities and property rests solely and completely with the terrorists who perpetrated the attacks." Security was lacking in Benghazi and officials in both Washington and Libya failed to recognize the dangers in the country. According to the report, security forces at the compound were identified as a militia group called the February 17 Martyrs’ Brigade that the report said included Islamist elements. Unarmed security contractors from a company called Blue Mountain Libya also proved inadequate against the Sept. 11 attacks. "Overall, the number of Bureau of Diplomatic Security (DS) security staff in Benghazi on the day of the attack and in the months and weeks leading up to it was inadequate, despite repeated requests from Special Mission Benghazi and Embassy Tripoli for additional staffing," the report said, adding that investigators found "a pervasive realization" by U.S. personnel that security of the mission "was not a high priority for Washington." Regarding intelligence, the report said there was "no immediate, specific tactical warning." However, a local police officer was spotted by compound security on the morning of the attack taking photos of the compound villas with a cell phone from the second floor of a building across the street, apparently casing the facility. "The individual was reportedly stopped by BML guards, denied any wrongdoing, and departed in a police car with two others," the report said. The report also said that in the weeks and months prior to the attack there was "a deteriorating security situation" in Libya that was reliant on an "armed but poorly skilled" militia and unarmed contractors. Additionally, the report said the militia in charge of security showed "troubling indicators" that the group was not protecting diplomatic vehicles due to protests over salary and working hours. The report said communication, cooperation, and coordination among Washington, Tripoli, and Benghazi was "constrained by a lack of transparency, responsiveness, and leadership at the senior levels." "Among various Department bureaus and personnel in the field, there appeared to be very real confusion over who, ultimately, was responsible and empowered to make decisions based on both policy and security considerations," the report said. The board praised the "remarkable heroism" shown by U.S. personnel who tried to defend against the attack but who "fell short" after dozens of attackers broke into the compound, possibly through a gate that was left open by a security contractor. According to the report, there was "little evidence that the armed February 17 guards offered any meaningful defense of the SMC, or succeeded in summoning a February 17 militia presence to assist expeditiously." The central government in Tripoli had little influence or control of Benghazi, a known redoubt of Islamist militia groups since the ouster of Libyan leader Muammar Gaddafi last year. Two unarmed drone aircraft were dispatched to the attack to provide video intelligence. However, while the report claimed the U.S. government response was "timely and appropriate … there simply was not enough time for armed U.S. military assets to have made a difference." A Marine Corps Fleet Anti-terrorism Security Team was dispatched to the country a day after the attack. 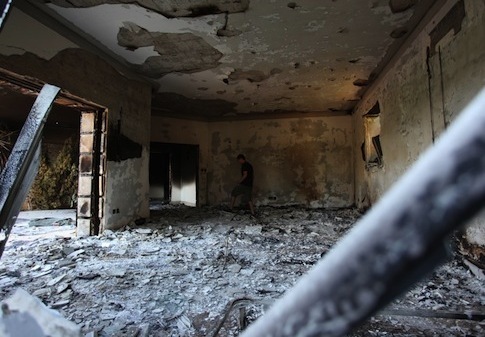 A series of relatively minor attacks involving militias in Benghazi began in March and included armed robberies, shootings, and several small-scale bombings, including an improvised explosive device attack in June that blew a hole in the compound wall. Attacks escalated in the summer with several rocket propelled grenade attacks and grenade bombings. Those attacks "took place against a general backdrop of political violence, assassinations targeting former regime officials, lawlessness, and an overarching absence of central government authority in eastern Libya," the report said. A timeline in the report provided dramatic details of the efforts taken by several security officials to defend Stevens and themselves during the attack on the compound and a subsequent attack on the CIA annex, about a mile from the compound. The report made a series of recommendations for improving security at "high-threat" posts like the ones in Benghazi. This entry was posted in National Security and tagged Al Qaeda, Ansar al-Sharia, Barack Obama, Benghazi, Middle East, Obama Administration, Susan Rice. Bookmark the permalink.